Earlier this week, I discussed using grocery flyers to plan meals and mentioned that I’d be using some of the items I discovered there to make this week’s meal. It turned out that my craving for asparagus was just too strong and I wound up using it as the foundation for a stir fry dish. This one turned out really well and I can virtually guarantee I’ll be making it again when our fresh asparagus starts appearing in April. One key thing you’ll notice about the above dish is that it uses small cubed tofu as the protein source. Don’t sweat the tofu if you’re not into that kind of thing – instead, ignore that part and skip down to the optional ingredients at the bottom. I actually made a double batch in these pictures (as our family loves stir fry and will eat it for days), but I’ll just list the ingredients that would go into a single batch. The key to any good stir fry is the vegetables and the flavorings you add. 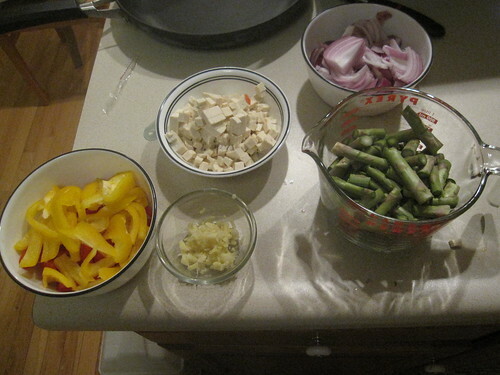 Here, I used one onion, four or five cloves of garlic, three cups of asparagus (with the stems cut about every two inches), a medium bell pepper, and a bit of fresh ginger (it’s optional, but tasty). For the flavoring, I used a couple tablespoons of vegetable stock, a tablespoon or so of soy sauce, and two tablespoons of rice vinegar (if you don’t have rice vinegar, substitute a tablespoon of lemon juice – seriously, it works as a decent substitute, though the flavor of the dish changes a bit). I also used sesame seeds as a topping. You’ll also want to flavor this with salt and pepper and perhaps a bit more soy sauce. In addition, I suggest making about five cups (cooked) of rice of your choosing. Instant rice works fine. 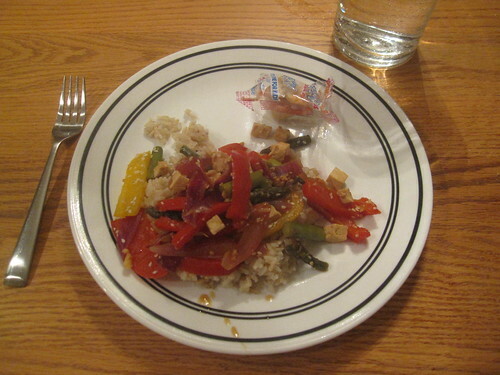 For the protein in the dish, I use about four ounces of tofu, cut into tiny cubes aboout half an inch in size. If you’re not into the tofu, see the optional ingredients at the bottom. The total cost of the ingredients in my double batch was an estimated $12.50, since I prorated the cost of many of the ingredients (if you only use a bit out of a big bottle, the cost of that bottle is spread out). That makes the above recipe cost $6.25 in ingredients. Simple – chop up all of the vegetables. Chop the onion in half and slice each half about ten times. Mince the ginger – you really don’t need much of this. Cut the asparagus stalks as a bundle. Even out the tops, then cut every two inches down the stem until you have around three cups of asparagus pieces. Cut the bell pepper in half, then cut each half into thin strips. Once you’re done, you can store each of these vegetables individually in the fridge if you’re doing this part in advance. If you’re using something besides tofu for the protein in the dish (like chicken or beef), chop the meat up into tiny pieces in advance, too. 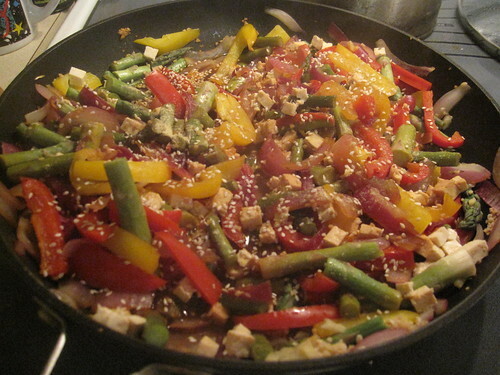 Actually preparing the stir fry only takes about fifteen minutes if you’re using tofu. If you’re using meat, it’ll take a bit longer, as you’ll cook the meat first and then start doing the rest of the preparation right in the same skillet as the meat pieces. So, you’ve either got a large empty skillet or a skillet with already-cooked meat in it. 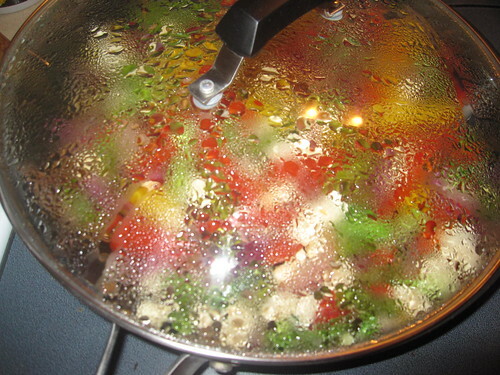 In either case, add the vegetable stock and turn the heat up to medium-high until the stock is just starting to boil, then add the onions and saute them for about three minutes, stirring all the time. Add all of the other vegetables (garlic, ginger, asparagus, bell peppers) and keep stir frying them for another three minutes or so. At this point, if you’re using tofu, add it. You should also add your soy sauce and rice vinegar (or lemon juice). Stir it again, then drop the heat down to low and cover the dish for about two minutes or so. You’re done! Take off the lid and add some salt and pepper to your taste. I also like to sprinkle sesame seeds on top, as shown here. Serve it with rice and some additional soy sauce. The big thing you can change with this dish is to substitute the tofu for meat. Both chicken and steak would work well for substitution here. In both cases, I would cube the raw meat in advance of the meal, then cook the meat right in the skillet at the start, letting the later liquids deglaze the pan and add to the flavor of the dish. With stir fry, you really can edit the vegetables however you’d like. Other vegetables that might work well in this stir fry include green onions, spinach, kale, chard, or carrots. Use whatever’s on sale or whatever sounds particularly good to you.